Dismal and Dank... That's the best way to describe the Quality Inn in Washington, NC. While the lobby and online pix look inviting, they are deceiving. The room itself looked "ok" at a quick glance, until you look further and enter the bathroom. It's not just that it was outdated, it honestly was depressing and made us feel not only claustrophobic but fearful of what else may be inhabitating the room. The odd odor from the hvac unit added to the overall "dank" vibe. The only positives were the beds were comfy and the front desk check-in was pleasant, except when the bill hit our bank account, the aarp discount did not reflect. This room was not worth the "discounted" $85 (discount we didn't receive) and definitely not worth the $96 charged to our acct!! The free continental breakfast was adequate, as it was free and well attended, but that's where the positives end. Our last stay in Washington, NC was with the Hampton Inn for basically the same price, and that's where we will go next time. My suggestion, until Quality Inn offers quality rooms, stay elsewhere! My family and I had a terrible experience at Quality Inn Hotel of Washington NC. My family and I stayed 2 nights (Wed Oct 31st and Thurs Nov 1st). Thursday morning while downstairs getting breakfast I was asked by the front desk clerk and a housekeeper if we needed housekeeping services. I replied No but my sister which was my guest replied YES please. She informed them both her bed sheets had stains on them resembling dried blood. Just then the head housekeeper stated "oh that's fruit punch and it ain't coming out!" My sister asked could she still have fresh linen because they were dirty. The head housekeeper became frustrated. I replied I was just asked if I wanted housekeeping services and I would like her sheets changed please. Reluctantly she agreed. The front desk clerk and the other housekeeper heard this exchange. Now this took place at 9am. We preceded to the room. Hours later another housekeeping employee came to the room and handed my sister a brown wooly looking blanket. We commented we expected to get the linen changed. She replied "that's what I told you bring you...this comforter and I'm just doing what I was told." My sister sat down to take a drink thinking this was all too much and she accidently spilled her drink. When no came to provide clean linen we decided to call the front desk. The manager was filled in and told my sister and I..." the hotel has adopted a new green rule in which if a customer stays more than one night the hotel waits to change linen for 3 days within the stay." We informed her before the spill we had been waiting for fresh linen or sheets to be changed. The manager was even more nasty and reluctant to validate our request. She stated her housekeepers had a specific amount of rooms to clean and she was not about to make her employees stop what they were doing to come change the sheets. We responded what do you expect us as customers to do. Should we purchase our own sheets or even take the sheets out to a laundry facility and clean them ourselves. Tina was even more rude commenting the liquid my sister spilt probably messed up the bedding and mattress. We proceeded to tell her the drink only made it to sheets and mattress topper. I told the manager we need clean sheets and she stated you have to wait. I said that’s fine we only want clean linen for the room we paid for. In disbelief I couldn’t believe a hotel establishment would do such a horrible job and basically deny customers fresh clean linen. The sheets weren’t changed till 3pm…….3PM. Unbelievable!!! But that isn’t the end of our complaint. We checked out and I even waived bye to the front desk clerk. He waved back. Later that night we decided and needed an extra day or two to complete our visit. ALL OTHER HOTELS WERE BOOKED BC OF WORKERS IN THE AREA. So with terrible luck I proceeded to return to Quality Inn to purchase a room. I was told by the same front desk clerk that waived as if nothing negative had happened that I was put on a DO NOT RENT LIST. In disbelief I responded WHY because I was shocked. We had a most negative experienced and yet our actions and speech remained appropriate. We weren’t rude to employee at the establishment. Although we as customers had been treated as less. He stated the manager put it in the computer but didn’t state why. I asked him to contact her. He said he did but didn’t get a response. He also stated housekeeping told him I was put on this list because of my guest. My guest was my DISABLED SISTER who asked for fresh linen. We had to drive to the next city Greenville NC to get a room. The general manager of the hotel supposedly won’t be in until next week. I will be speaking to him and requesting a full refund. I will not be returning to the establishment and I’m attaching pictures of the urine and blood soaked sheets and mattress of the room we received. My stay was for business, and it was very difficult to find lodging post Hurricane Florence, and it was all I could get. The staff is amazing and very attentive. The linens we're clean, the property needs to be completely gutted. The carpets are filthy, the windows are dirty, the a/c unit in the room could not be adjusted because the controls are broken. The topper was finding a dead roach inside the bedside alarm clock. Needless to say, all of my clothing is going straight to the dry cleaner. Keep the staff and gut the building. I stayed at this hotel for three nights. I am a returning customer. The bed and pillows were comfortable. The bathroom was clean and had plenty of towels. The water was hot when showering. The microwave and refrigerator worked as intended. I would stay here again. This facility was very old, outdated, and felt dirty. There was caked dirt in the bathroom corners. A staff member cursed in front of my children, and another was eating while helping another guest check-out. We were scared to eat the provided breakfast, and noticed another family who had gone out and brought food back to the motel for their breakfast. We cancelled subsequent nights after our first night there, and went to the new Fairfield Inn. Now THIS is the place to stay- we had an incredible experience there. After my experience with the Quality Inn in Morehead City, I was reluctant to stay at another Quality Inn. A last minute change in a work project forced me to spend the night in Washington. My boss scheduled my hotel and reserved a room for me at the Quality Inn. I must admit, I was pleasantly surprised. Just like the other Quality Inn, the staff was outstanding. They were extremely friendly and helpful. The surprise was in the quality of the building. Don't get me wrong, the building is by no means new, but it is well maintained. I was pleased with the layout and luxury for the price paid. I am sure I will stay there again in the future and would be willing to recommend it to others. It is not the Ritz but for the price you get quality and friendly staff. I normally stay here when I go home for a visit. There is a young lady at the desk who ensures that the room is ready. Tina who is a Jill of all trades and a master of many. Everyone goes out of his or her way to ensure your stay is a great one. Why pay exorbitant prices to feel the ambiance when you can spend much less and feel "welcome"? Friendly personnel when we arrived. Hotel was clean. Room was ice cold when we walked in. It is almost summertime, but cool would be sufficient. The mattress was very comfortable and we liked the pillows too. A microwave, small fridge and an in-room safe are also nice touches if you need them. The scrambled eggs are obviously from powdered eggs. Yuch! There's nothing one can do to improve them. I've also had better waffles too. Not sure about the mix they use. But the biscuits and sausage patties were edible. The pastries looked OK.
We had a loss in the family. The folks at Quality Inn were able to book us a last minute room on Memorial Weekend, and to add it was for a Saturday night stay. Upon arrival the lady up front, Tina was very helpful and friendly. The room was very clean. The wife did a thorough inspection of the bed linens, mattresses and pillows and all was perfect. I left my pillow behind and between Tina and Brook, they were able to get it boxed up and sent UPS to me. Lastly, the breakfast was simple, but still pretty good. And the staff were willing to assist us in preparing our plates. We will definitely stay with them again. There are two floors in the hotel, all have interior access. I chose a first floor queen room because they don't have an elevator. The room was nice but a little cramped because of the oversize semi handicapped bath. The room was clean with the exception of the water stains in the toilet bowl. WiFi was a little slow. they did have electric outlets everywhere so I didn't have to use the extension cords that I travel with. Good breakfast. 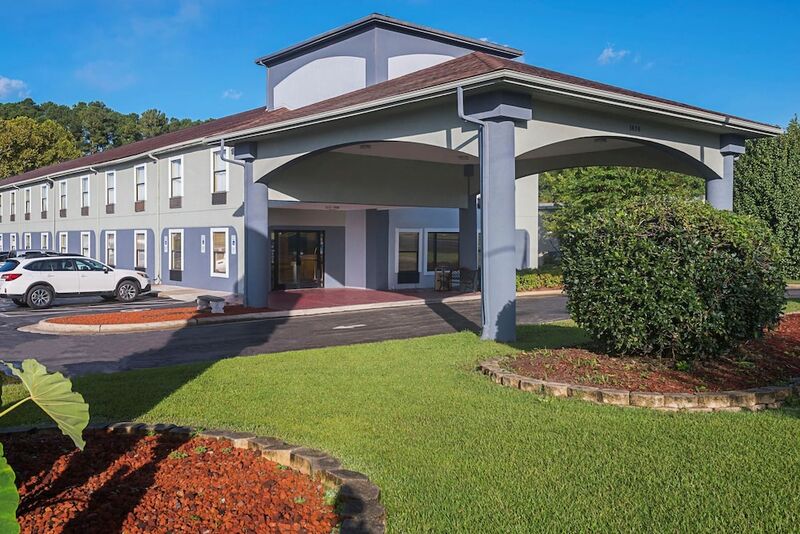 Washington Square Mall is a short stroll from Quality Inn Washington, and other popular attractions like Cypress Landing Golf Club are within a 15-minute drive. This 56-room hotel welcomes guests with free breakfast and conveniences like free in-room WiFi and free self parking. Guests can enjoy cable TV and stay connected with free WiFi. Other standard amenities include a refrigerator, a microwave, and a coffee maker. Renovated in 2016, Quality Inn Washington offers free WiFi in public areas, coffee in a common area, and a computer station. If you plan to drive, free parking is available. The front desk is staffed 24 hours a day to help with dry cleaning/laundry and securing valuables. Additional amenities include express check-in, express check-out, and a picnic area. The preferred airport is Greenville, NC (PGV-Pitt-Greenville): 24-min drive, 19.9 mi/32 km. The front desk is open 24 hours a day, and checking in and out are easy with express services. Driving? This property offers free self parking, along with free RV, bus, and truck parking.